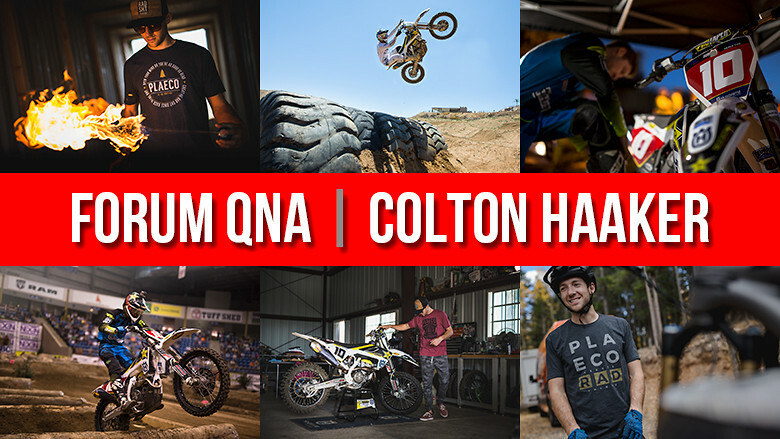 This week's guest in the Vital MX forum QNA is Colton Haaker. If you've seen his recent Heater video, you know Colton is a bad dude on a dirt bike, and that's before you start checking off items like the Superenduro World Championship he scored last year, or the way he's been tearing up the Endurocross series this year aboard his Rockstar Husqvarna. Needless to say, he's got some skills. Bring your best questions for Colton, and he'll be peeking in here this week to answer them. As always, keep it respectful, and ask questions that you would like in a face-to-face meeting. Congrats on your success and enjoying what you do. Tell us a little about yourself before your name started showing up in the results pages. When did you start riding? Was your first race an off-road event or mx? You're originally from Nor-Cal, any cool stories from the local scene like riding the upper ranch at Hollister HIlls OHV or Clear Creek after a rain, or any other local areas where you crafted your skills. Thanks for coming on here Colton. First, I was at the Atl endurocross this year. There was a tight left hand turn over a big log, into a smaller log, and then jumping into the pond. You and the other title contenders were hitting that smaller log so damn fast by pulling a wheelie and letting it slam down the front wheel. Yall made it look easy. However lots of other guys were trying to do the same thing, but they frequently got their feet knocked off the pegs, or just got squirrely. They made it look dangerous at best. So my question is, how do you do that so flawlessly? Is it technique, practice, or just better bike/setup? Second, the track this year was a little boring. Do riders have any say in the track designs? If not, what would you like to see more or less of? What's scarier, a big jump, or a big rock hop (not sure what you trials folk call em)? Exactly how big are you nuts? Must have a problem finding pants to fit. You are the man. Colton, have you ever considered racing a supercross or motocross national? I would presume that a really technical track would be right up your alley, as long as whoop sections could be mastered. Win one of those and you're instantly in the running as "The greatest all-around dirt bike rider in the world". Regardless, watching you ride is really amazing, thanks for sharing your skill-set with us. Finally posted after lurking for almost 5 years. I gotta say, I've shown that new video to 30+ people in the last 24 hrs and EVERY SINGLE person was in awe. If I had 10% of your talent, I'd be happy. And the 360 trick was something I used to do on my BMX bike back in the early 80's, there's not a chance in hell I'd ever try that on one of my dirt bikes. Congrats on the vid and thanks for including the out takes. It makes us all aware that you are still human ! I think this is going to be a recurring question in this thread. It would be awesome to see how you could do. For my question: Do you have any plans to do any other hard enduro races besides Erzberg? Like maybe the whole series? Hey Ted, you have some good knowledge of the norcal scene obviously! Yeah started riding at 7 dad was an ISDE Gold medalist in the 80's. Grew up just going to Hollister Hills, Clear Creek, family trips to a lot to different riding areas. Really my dad took me wherever he was riding with his club The Los Altos Dirt Bikers. As I got older I got into more moto. I raced my first MX race at 12 at the Hollister GP track. By the time I was 15 I was racing 80s in the intermediate and expert classes in local mx AMP, GFI series and also doing some Youth District36 harescrambles as well. That same year pops took me to Mammoth Mountain I got a sixth overall in the 80 14-16 expert or something. Villopoto won... Quickly after that I had some injuries on a 125 mainly because I weighed a buck ten and parents said no more dirt bikes cause of an alarming amount of concussions. In highschool now, got some good grades dad got me a trials bike thinking that would still be fun but not as dangerous did that the next two years non stop. Like everyday all day non stop. Won the expert national championship and went pro the same year at 17. A month later I raced Las Vegas Endurocross on my trials bike shocking everyone with a 4th place finish. (the year Taddy won his first endurocross race and kept David Knight from a $50,000 triple crown prize) Since than I have been a regular Endurocross rider on a full size dirt bike was a Lucas Oil sponsored rider for years doing the series as a privateer, raced two mx nationals in 2010 finishing 24th OA at hangtown on a stock kx250f and 24th OA at Washougal in the 450s. This year I won the Super Enduro World Champioship in a thrilling last lap battle. And I am now currently leading the Endurocross series by 12 points with three rounds remaining! Colintrax yeah so a lot of it is technique and some of it is bike set up. Ultimately its something we have practiced over the years. I remember the section your talking about and I was trying to wheelie and lift the background off the ground a bit to clear the log as best as possible. You know ATL was a weird place for Endurocross to start the series this year. I know that a lot of their materials from the race two years previous rotted and they had to make the track with less material then they anticipated. Ultimately each track has its difficult sections I think the tracks have been getting a little more race-able and fast paced! I really appreciate that! You know I have never done a 360 on anything but my dirtbike. Not a trials bike, a mountain bike, a BMX, scooter, hardly even just on my feet but something about it on my dirtbike just came naturally... I cant really explain it any better! Thank you for sharing the video I am stoked on the overwhelming positive responses I have gotten from it! Hey, thanks for your responses! When you would ride with your buddies or your Dad (when you got older), was there a spot you liked to be on the trail/off-road (leader or follower)? I'd ride with some friends and would lead and with others I'd feel more comfortable running behind them. Fantastic video! Your skills on a dirtbike are amazing! Congrats on winning the world title! Tell us about your bike - Husky FC350. What are some of the mods you make? Have you ridden or compared your 350 to the all new Husky TX300? What are the advantages of the 350 4-stroke vs the 300 2-stroke in Endurocross? Awesome QnA so far, thanks for coming on board! I've raced the amateur class in Sacramento for a few years now and I have a question about preparation. Now that the Sac round was nixed I'm going to make the drive down for the Ontario round, but I want to make sure I'm as ready as I can be. My local riding spot is Carnegie SVRA, not sure if you've ever been there but there are some pretty nasty areas if you hit the unmarked single track. I generally just practice by finding the worst stuff out in the hills to ride through that I can, but I still feel under prepared when I show up to race against the guys who race every round. My question is do you have any suggestions on how to prepare for those of us who don't have access to a track? Any specific techniques to practice out in the hills or the flats to help with riding an endurocross track? I mostly struggle with the matrix section (like everyone else), so that is my main area I need serious help in. Sorry for the loaded question, but any quick tips would be greatly appreciated! First off how do you like your surname to be prenounced ? And how many attempts would you guesstimate it took you to master the 360, probably one of the the coolest thing I have seen on a dirtbike ! I seriously envy your skills on a bike! It seems like you're good at everything! What do you think about two strokes? It looks like they're a bit more competative in enduro. Thank you for doing the QnA! My dad always led the rides with me an his buddies. He always knows where he's going and knew the trails everywhere we went better than anyone else. Now I lead the rides Most of the rides I take friends on they usually thrash. But I know what they are capable and I usually like to put them just a notch out of their comfort zone all the time makes it interesting! I have had a couple people completely freak out on me and just leave the trail ride though! My FC350 has the WP cone valve forks, trax shock, a heavier flywheel, and some motor modifications that I do not know anything about but the ecu I have set up through testing and only thing else is basically my fmf pipe with the swooping header. Its a factory bike but nothing crazy on the modifications! I ride ALOT... I would love to work out everyday and I have in the past I have found that for me nothing as good for training as seat time. I do like mountain biking and road cycling and lifting weights though hopefully at least once a week to compliment my on the bike training! You know probably the first day I landed one fully around on the honda it took maybe 10 to 15 tries.. I found a 180 to be extremely easy then the 270 was not too bad but thats a as far as I would get until you commit to going WAY WAY higher and farther. The commitment level goes way up for that last 90 degrees! I love my two strokes I have a 300 usually all year and I own a 125. I try to ride them as much as my endurocross bike! I think the two stroke is the only way to go for really difficult Enduro mostly extreme stuff like erzberg. It has power from zero to 70 plus mph it wont overheat as easily doesnt stall as much but when it does it starts first kick, its light and nimble, it likes the nasty stuff for sure! I think its great that enduro guys see the advantages a two stroke has and openly admits liking it. I wish more guys would see that. What is the most challenging race you've had? Do you have any ideas to grow the endurocross or hard enduro fanbase within the US? I can't watch endurocross anywhere it's such a bummer. I loved watching the superenduro series on redbull.tv. It seems like it just hasn't caught on as much as in Europe. The promoters need to post videos online and get more fan engagement.